Picking up from where Alex left off with the starting staff in 2018, we’ll take a look at the 2018 relievers. Despite what it felt like following this team on a daily basis, the Dodgers’ bullpen was actually quite good. The only three qualified relievers (49.0+ IP) were Pedro Baez, Kenley Jansen and Scott Alexander. It was a wild year for the Dodgers relief group in that regard, featuring 28 different pitchers to log at least one full inning (sorry Enrique Hernandez). There were plenty of highlights or lowlights last season– whatever you’d like to call them. Deadline addition John Axford had his fibula broken by a comebacker 3.2 innings into his Dodger tenure. Wilmer Font had an 11.32 ERA over 10.1 innings. Pat Venditte threw 14 innings — 8 2/3 left-handed and 5 1/3 right-handed. Kenta Maeda and Ross Stripling both had brief, successful tenures in the bullpen. Zac Rosscup had an immaculate inning. Dennis Santana could’ve had a strong relief season, but after 3 2/3 innings in one appearance, he eventually had to be placed on the 60-day DL for a right rotator cuff strain. Ryan Madson was good until well, some unfortunate stuff happened in the World Series. Jansen struggled. Obviously, it was a … fun year. Starting with the obvious, Jansen is the rock in this bullpen who ultimately faltered. It happens. He posted 3.6 fWAR in 2017 compared to 0.4 in 2018. If you add the difference of 3.2 fWAR to the cumulative 3.1 fWAR of the rest of the Dodgers pen, it’d put the Dodgers at 6.3 fWAR, bumping them from 16th up to fifth. His 27.1 percent soft-contact rate was second in league behind only Joakim Soria. He missed two weeks in August as he showed symptoms of an irregular heartbeat with the increased elevation in Colorado. After he returned, he had to decide on his dosage of heart medication, because if he took too much he’d be sluggish, which is an issue for a professional athlete. He had his EKG levels monitored every day after the incident, all while knowing he’d have heart surgery after the season. He definitely didn’t pitch like himself this year. He surrendered 13 homers compared to just 15 over the three seasons prior. He posted the highest ERA, FIP and xFIP of his entire career, in addition to his lowest strikeout rate at 28.4 percent. Sometimes I believe it’s easy to forget that these players are people too. I’m sure Jansen wouldn’t blame a dip in his performance on his health, but I know I’d have a hard time doing anything at all with heart surgery around the corner. Did he blow two saves in the World Series? Yes. None of that changes, but you can only hope the best for him and his health above all else. 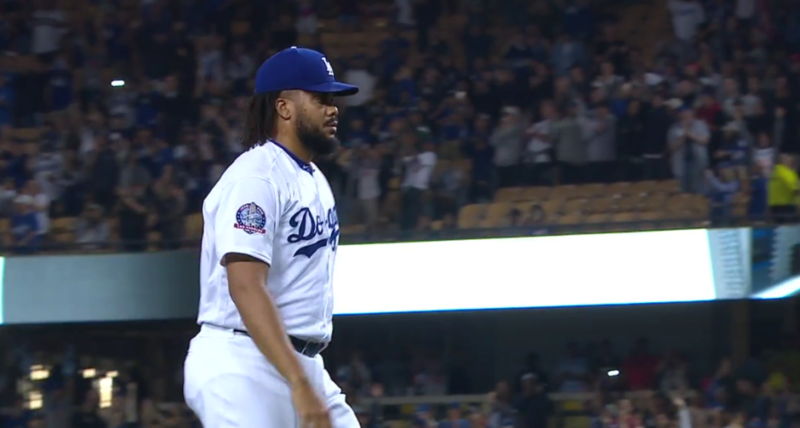 Hopefully we get to see the Kenley we know in 2019. Alexander was pretty much as advertised in 2018. His 70.6 GB% was second only to Brad Ziegler. He limited hard-contact and generated soft-contact as sinker pitchers tend to do. Of 151 qualified relievers, he allowed the fourth lowest hard-hit rate at 24.7 percent. Additionally, his 27.0% soft contact rate was third behind just Jansen and Soria. He dropped his sinker usage from 93.4 to 83.8% and upped his slider usage to 10.9 percent. He had the exact same strikeout rate as he did in 2017 at 20.9%, and his 9.9 percent increased to 10.1 percent. If he can drop the walks he’ll take a jump up to the next level. Interesting enough, he’s as close to a LOOGY as the Dodgers had. His 84.1 percent ground-ball rate against LHP was the highest in the league. He had a 0.90 WHIP and 2.13 FIP against left-handed hitters, compared to 1.57 WHIP and 4.70 FIP against right-handed hitters. He ranked 20th in the league at limiting hard contact, at 28.5%. His 23.8% soft-contact generated was 11th. He averaged 96.0 on his fastball while increasing the usage of his slider (22.8%) and changeup (14.9%) to career highs. Remarkable as it was, it’s unfortunate that his reemergence happened during a down year for Jansen. It was an odd situation when Baez was on a roll to end the season, and in the midst of a tight division race it was realistic to feel more comfortable with Baez pitching than Jansen. In his age-21 season, Ferguson posted a fantastic season after being converted to a reliever. When called up to spot-start, he had started all 63 appearances of his minor league career. As he posted a 7.59 ERA over 10.2 innings, he was moved to the bullpen where posted the above stats for the remainder of the season. He struck out 47 and walked only 6 over 38.1 innings, good for a 30.5% strikeout rate and a 3.9% walk rate. If Ferguson qualified as a reliever, that strikeout rate would’ve been 24th in baseball of 151, and the 3.9% walk rate would’ve been the fourth lowest. He challenged hitters in the zone with a 94 MPH fastball that plays up in the zone, and the looping curve he throws roughly 25% of the time. He’ll likely stay in the pen moving forward unless he’s made significant progress with his change-up, as it’s extremely unlikely that he can stick as a starter with just two pitches. Hudson was signed to a minor-league deal after Tom Koehler missed the entire year with a sprain of the anterior shoulder capsule. His 45 innings were the fourth most on the team, and it’s amazing that the Dodgers had such a solid relief group with Hudson contributing a large chunk of those innings. He was signed four games into the season, most likely with the idea that he could be Morrow-esque. The issue is that Koehler was likely signed for that reason, so Hudson became the backup Morrow-Esque potential signing. He wasn’t great, but for a minor-league deal, he was effective, and much needed especially in the first half of the season. Cingrani looked poised for an excellent 2018, but unfortunately missed the majority of the season with a left rotator-cuff strain. Looking just at the ERA, obviously Cingrani wasn’t effectively limiting his runs to start the year. However, he had a .354 BABIP against him in those limited innings. If he were a qualified reliever that would’ve been the 4th highest BABIP in the league. On another note, through those 22.2 innings Cingrani had struck out 36 batters for a 37.9% strikeout rate. That would’ve been 8th in the league, just ahead of Adam Ottavino. Hopefully he’ll be fully healthy in 2019, because when he’s pitching his best, he looks like the best reliever on the team outside of Jansen. Chargois was an interesting pickup and showed signs of being really effective reliever. As nearly every Dodger reliever, his season was shortened due to a month of “nerve-irritation”. While on the mound, his 61.8% ground-ball rate was the sixth highest in the league. He mixed in a mid 80’s slider roughly 50/50 with his mid 90’s fastball that generated most the ground-balls. Additionally, he also generated soft-contact at 23.1% or 16th in the league. A major blip with him, was that when he did miss his spots, he got lit up. His 28.6% home run per fly ball rate was second in the league. Simply put, with Chargois it was essentially ground-balls or homers with not much in between. Similar to 2017, the Reds and Dodgers agreed on a deadline deal that sent a reliever with untapped potential to the Dodgers. Also similar to 2017 with Cingrani, Floro started flourishing once he was with the Dodgers. His ERA, FIP and xFIP all dropped. He posted just a 1.05 WHIP which was 29th of qualified relievers, identical to Aroldis Chapman and Dellin Betances. His .180 batting average allowed was 15th and he generated a ton of ground balls as well at 55.1% combined between the Reds and the Dodgers which was 20th in the league. Overall, his 2.25 ERA was 11th in baseball. His strikeout rate jumped from 17% to 27.7%, as he essentially stopped throwing the change-up like Cingrani. He also dropped the usage of his sinker 15%, and replaced it with significantly more four-seam fastballs and sliders. Fields was essentially the opposite of Alexander, Floro, and Chargois. His 51.4% fly-ball rate was the fifth highest of all relievers, while his 22.9% ground-ball rate was the second lowest. He allowed just a .226 batting average on balls in play against him which was the eighth lowest in the league, but that isn’t out of line with him being so fly-ball prone. His strikeout rate continued to drop, down from 26.9% in 2017 to 21.4%. Additionally his average fastball velocity dropped from 95.4MPH to 94.7. He was still very solid, and with a few tweaks he might be able to regain some of those strikeouts. There’s nothing wrong with not being a strikeout pitcher, but when you’re allowing as many fly-balls as Fields is, eventually more and more will start going out. There were a handful of other pitchers that were serious contributors to the relief group in 2018. Most importantly, Hernandez made just one appearance in the 2018 season, in the 16th inning against the Phillies on the road. He allowed three runs including the walk-off homer while recording just one out. 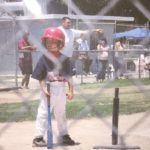 He got his appearance as a pitcher, and still couldn’t get behind the plate for just one at-bat to have played all nine positions in a single season. Health permitting, this bullpen is looking very good moving forward. Sure, it doesn’t have many big names outside of Jansen and Joe Kelly, but that’s how all bullpens operate outside of the Yankees. Floro, Chargois, and Cingrani should all be able to contribute more in 2019. Baez looked strong to end the year. Ferguson will likely return to the ‘pen and Julio Urias has to pitch somewhere. If Jansen can moderately resemble his 2017 form, this group looks very promising moving forward. That’s a big “if,” though.